It was always easy to love Tom Jobim‘s music as it captured the very essence of cool; the exotic new Brazil of the 1960’s and 70’s. While the music may not have captured the grim realities of the barrio’s, it spoke powerfully of the hope and dreams of a new generation; of educated hip, urban Brazilians. The media showcased endless white-sand beaches, beautiful bikini clad girls and lost love under palm trees, but this was the era of ultra exciting modernist architecture. Best evidenced in the wonderfully executed, delightfully surreal Brasilia city. This city was the revolutionary vision of three men of genius and they carved it out of of the jungle in a mere four years. The President’s futuristic dreams were eventually overrun by greedy money men, a military dictatorship and powerful elites, but the legacy of Brasilia remains. These visionaries were President – Juscelino Kubitschek, architect –Oscar Niemeyer and urbanist- Lucio Costa. It was into this hopeful world where anything seemed possible, that Antonio Carlos Jobim and Joao Gilberto appeared as forces of nature. Before long they reached larger North American audiences via Jazz super-star Stan Getz (and others). The stories surrounding the Getz/Gilberto (‘Girl from Ipanema’) session are legendary; suffice to say that Astrud Gilberto wife of the talented and co-credited Joao Gilberto was not supposed to be on the session. She was reluctantly included at the last minute. From 60’s house-wife to stardom in the blink of an eye. It was a later recording session by Rudy Van Gelder (for Creed Taylor’s CTI label) that took me deeper. The album ‘Wave‘ has a sense of place and everything about it is exotic and beguiling. I love the title song and I have a number of Jazz versions (Bossa Nova and otherwise). Under Jobim’s hands it swings like crazy, in a very authentic Brazilian way. When you listen to Tom Jobim and Elis Regina or to Tom with Brazilian musicians you realise that their time feel is subtly different from anything North American. As with many Jobim albums the recording is a heady mix of unashamed romanticism juxtaposed with a hint of minimalism (perhaps like Brasilia itself). This is in part due to arranger Claus Ogerman (who remembered to leave open spaces for the individual musicians). The sense of unexpected space in the midst of such lush orchestration speaks more about Jobim’s genius. He was a great composer, and a great performing artist. His spidery piano lines and urgent guitar rhythms are also miniatures of perfection; not a single note too many. For me ‘wave’ captures the essence of Copacabna beach, Rio de Janeiro, and Brasilia. 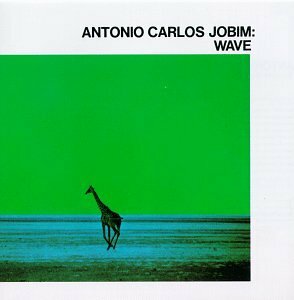 Jobim’s own renditions of ‘wave‘ changed with the years; one version on the Warner Brothers ‘Terra Brasilis‘ album sounding closer to Delius than to Jazz (that is until you here the voicings). The ‘Wave‘ album cover is a bookmark of the times; iridescent lime green sky, purple Giraffe (or other odd colours in later additions). I have included an informal version of ‘Wave’ by Tom and a few of his friends. The 60’s clothes may appear strange at this distance, but the music is perfect. In the late sixties I saw the French film ‘Our Man in Rio‘ staring Jean Paul Belmondo at least three times. I have not seen it since then but I would love to revisit it. It may appear corny now, as many films do with the passing of time. If that happens I will not be moved, as my visions of sixties Brazil cannot be tarnished. I have this album in my head and the mere thought of it induces the heady whiff of nostalgia. It was hard to find this article in google, but i am glad i found your interesting page. Many years ago as a brand new blogger I posted this. It is still a frequently visited post, so I freshened it up a little and sent it around again. Maybe you like to know that the cover of ‘Wave’ came in two colour settings: green and red. You can see the front and back cover in red at http://thenakedphotopodcast.com/2010/10/27/coming-up-in-tnphoto-ep-4-pete-turner/. The photograph is by Pete Turner, and the artwork is by Sam Antupit, who did a number of splendid covers for other Brazilian acts on A&M records, such as Tamba 4 and Walter Wanderley, and for Jobim’s 1970 album ‘Tide’. Thanks AD that explains why someone had once talked about having a copy with a red cover. Yes truly great art work – downloads sadly miss that added bonus because the artwork does not have the same vibe. What is worse the liner notes are completely absent and in some cases that can be a crime against art and literature. Long live great cover art. Oh … what to do….I love this music so much that I think that I will just dive in now and be happy – to hell with work. Glad to hear you like YVR’s airport – you should stick around next time for the riots :). Isn’t Montreal in the summer the best? Thanks for the compliments about designKULTUR – much appreciated. And yes, Tom is just another one of the cool Modernists that Brazil incubated in the middle of the last century. I look forward to learning lots of new things from Jazz Local 32. Thanks Michael. I have very briefly visited Vancouver and liked the Airports architecture – spent week in Jazz City Montreal (a blast). Your site is very cool – well done on the artwork. Yes to all on Brasilia and the Modernists – somehow Tom fitted right in there. Icons of cool one and all. Jobim is a great arranger, composer , musician and actually his singing is not half bad – in an Oscar Peterson sort of way. Whatever he does works on all levels.